Nice work! You dissected the numbers, collected customer feedback, and detected the products your customers want and need. Now, you are ready to bring on a new vendor that fits into the mold of what your buyer is looking for. So, let’s get down to business! All business owners aspire to make the most profit in their operations. In addition, most businesses understand that product is the most important item on a P&L statement. It’s one of our highest costs and the ultimate reason our customers shop with us. There’s a magic balance between carrying the right products, managing the amount, and the cost-inventory management. Hence, why the most successful businesses aim their attention to their margins. A shift in a point or two with the cost of goods margin can add or subtract significantly to the bottom line profit of your business. If you are a provider looking to choose a new vendor partner, you should focus on the cost of goods sold. Reason being, your profit margin is calculated off the cost of a product. We recommend aiming for a base number of 50 percent for COGS. However, meeting this number will not always be feasible due to the actual expense of a product and the commitment every provider should have for carrying the right products (or solutions) for their customer. To maintain close to 50 percent, choose a vendor with a variety of products, allowing yourself to sell incrementally and make up the difference for a higher costing product. Additionally, make sure to choose a vendor partner willing to negotiate price in this realm. Items like freight cost, volume of order, etc. give you a case for negotiation. Remember, lower costs equal higher profit margins. Mix these variables together with correct markups, exceptional inventory levels, and you are set to reach hefty margins. In the health care domain, it is crucial we provide the right product at the highest quality possible. Our products and our solutions have the ability to bring positive change to people’s lives. After all, we are #caretailers, and our customers define our jobs! Assuming you are in touch with the needs and wants of your customers, you already completed the first piece towards carrying a quality product—listening. If you have done that, then building a vendor relationship now becomes essential. Without a trusting relationship between you and your vendor partner, your customer cannot trust you. Avoid vendors that are product pushers, and find vendors that resort to getting to know you and your customer base. As a caretailer, it is your job to be your customer’s middleman and snag the products most beneficial to your customer. Ask the right questions to gain understanding for the needs of your customer base. Acknowledge what your customers’ needs are. Provide you with useful product intel to remedy the needs of your customers. Can provide sales data of the best items selling right now. The next piece of the puzzle is marketing. You cannot just carry great products and expect customers to shop your store; you must show them how your products can fit into their lives. Our team coaches providers on how to maintain lifestyle-centered marketing materials, because everything from photos to verbiage should capture a life relatable to your customer. Think about it: Would you ever buy a product that you didn’t envision functioning smoothly into YOUR life? No, you would find no use for it! So, it is your job as a provider to educate customers about why a product will improve their lives. One way to show them is through your marketing materials. For example, if Medicare only covers a baseline rollator with zero bells and whistles but you know that your customer will need additional products that will ease their usage, it is your job to show them why they need those products. For this case, maybe it is through a picture that depicts a person shuffling easily through a grocery store or a grandparent holding the toys of their grandchildren conveniently because she purchased an add-on storage part to their rollator. Whatever it is, again as a provider, we work for our customers and must satisfy their lives. With that, our next tip: Avoid vendors who say, “Here’s our marketing materials; now just put them in your store.” Chances are those materials will not correctly reflect your brand and will not display the right solution your customer needs. Instead, find vendors who care about your customers and want to help customize their marketing materials to fit your brand. A product sitting in your store or just placed on a shelf without your employees understanding it or knowing how to sell it often leads to poor sales and disappointment. To be an expert in the field, employees must be well-educated around a product, new advances, and knowledgeable about how a product could adapt to the customer asking for it. And, who better to learn about a product from then straight from the source? A trustworthy vendor should make themselves available to you and your employees. They should give you the best advice about how to move their products. Look for vendors that see your partnership as a mutual and long-term partnership. Successful vendors know that in order for them to be successful, YOU must be successful. These vendors will be the ones that don’t push product on you, who value your time, and not only help you choose the right product but educate you and your staff on how to carry it and sell it. 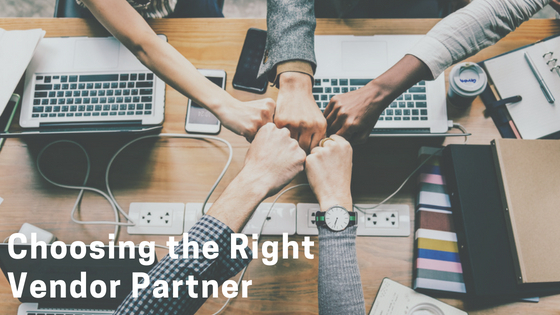 Find the vendor that understands your importance in the partnership and who is willing to go the extra mile to make sure you are just as successful as they are. You can set your store apart by bringing the correct vendors to the table. Your vendors should want to help you on the conditions of margins, product quality, marketing, and training. They will help you make sure you are providing the best for your customer. Lastly, the right vendor will know that a seat at your table will be an earned one, not an assumed right.